FS: Let’s start with the early years where you began racing at age 4. What made racing your sport of choice at such a young age? Was your family already involved with it? AH: Racing is all I’ve ever known! My dad used to drag race and race boats, my mom raced horses, my uncles were professional Motocross racers and also raced sprint cars so yes, it’s definitely in my blood. I started off with Motocross when I was 4, and competed in that until I was 14. I went to a few national events but I saw too many kids getting hurt so I knew I had to move away from that sport. I’ve never been the type of person to watch or play football, soccer, baseball, etc., it was just never my thing. FS: You raced BMX and Motocross and then switched to standup Jet Ski racing, which you became a World Champion doing. Why stop Jet Ski racing if you were so successful? 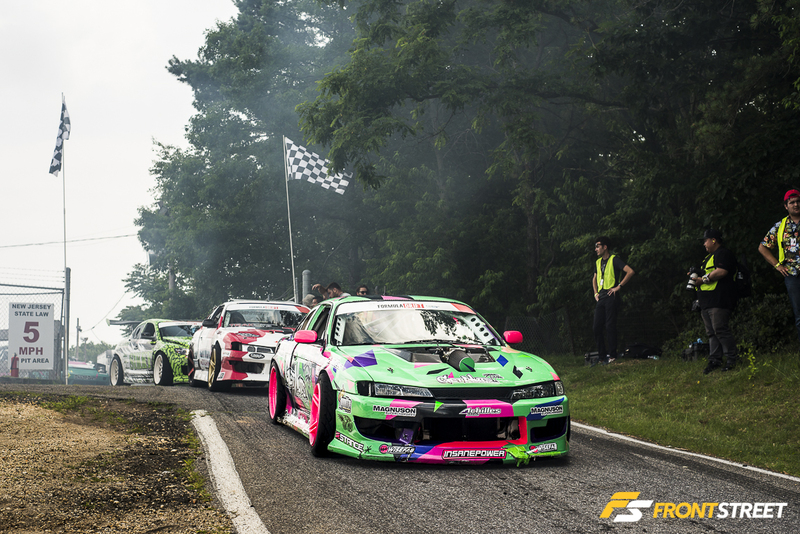 What made you look into drifting? AH: Jet Ski racing was definitely super fun and intense but there’s one huge problem, it’s not very well known. It’s very hard to get your name well known unlike some Motorsports, for instance, Formula Drift. One thing to being successful in the racing business is how you brand yourself. Also, I had a few bad crashes that made it nearly impossible to compete again. FS: What aspects of past BMX/Motocross/Jet Ski/Kart racing do you think best prepared you for drifting? AH: I think BMX/MX/Jet Skis/Karting all have their own little things that come into play when it comes to drifting. It’s hard to choose just one. I’d say Motocross and Karting gave me the most preparation for drifting. Motocross gave me the ability to take risks and just go all out and Karting gave me the correct racing lines and car control. FS: You’ve officially been on the Formula Drift Pro 1 circuit for 2 years now. What has been the toughest part of FD competition so far? AH: To me, the hardest part of Formula Drift is the budget. 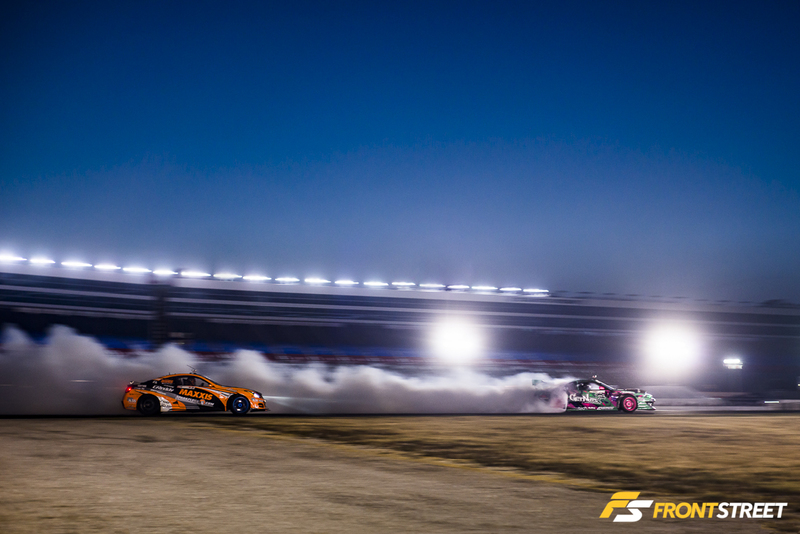 To run a season of Formula Drift is very expensive but in the end, it’s all worth it. 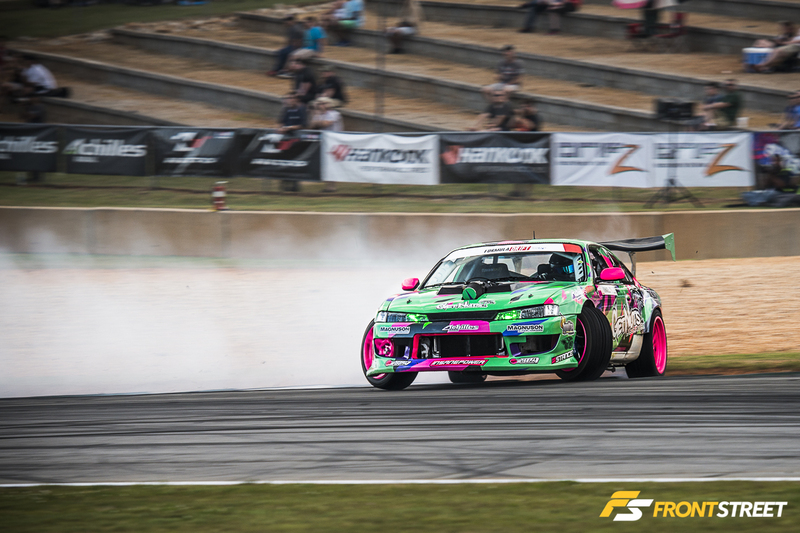 Another huge struggle for us in Formula Drift was our car. The car was ready to be retired and now we’re building a new car that will be heads above my last car. That’s a pretty remarkable second season! Looking back, what was your favorite moment? AH: My favorite moment of the 2015 Formula Drift series was when we knew we were going to be on the podium and I could see my family actually crying of joy. That moment right there made my whole season. I can’t wait for that moment to come again. 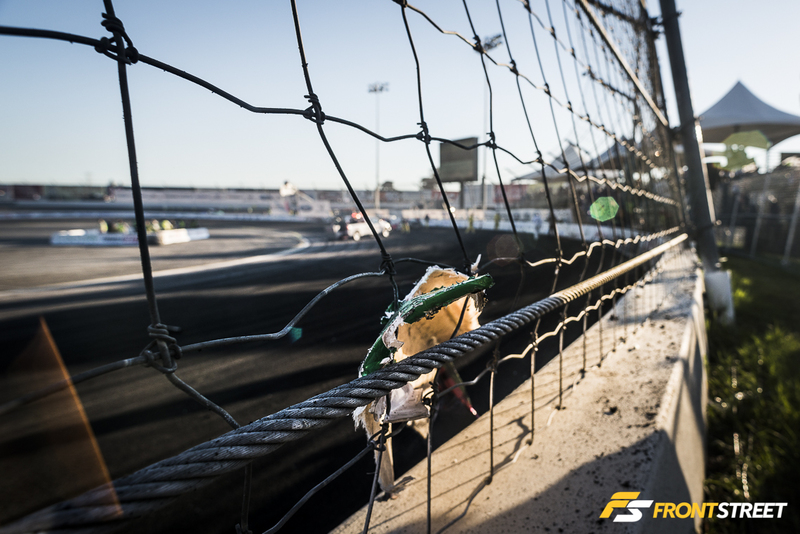 FS: Unfortunately, you crashed out of the final event in Irwindale. That must have been a huge disappointment. What was another moment you’d rather forget from this past season? AH: The crash at Irwindale was definitely not what we were hoping for but my team knew I was going to go all out at the end of the season. I actually ended up dislocating my hip when I wrecked at Irwindale haha! I don’t want to forget any moment of the season because we learn from our mistakes and that’s the only way to get better. FS: In each event we’ve witnessed you drive, you have so much angle you’re verging reverse entry. Do you take pride in being aggressive, hitting full-lock, and not being as reserved as some other drivers? AH: I have always been an aggressive racer; it’s just how I was taught. I will never play games or drive dirty though; I’m not like that. I do take pride in going all out each and every run because I know that’s what the fans want. Fans are what make this sport so amazing so it’s my job to keep them on their toes! If I don’t hit full lock at least once in my runs, I’m not satisfied. 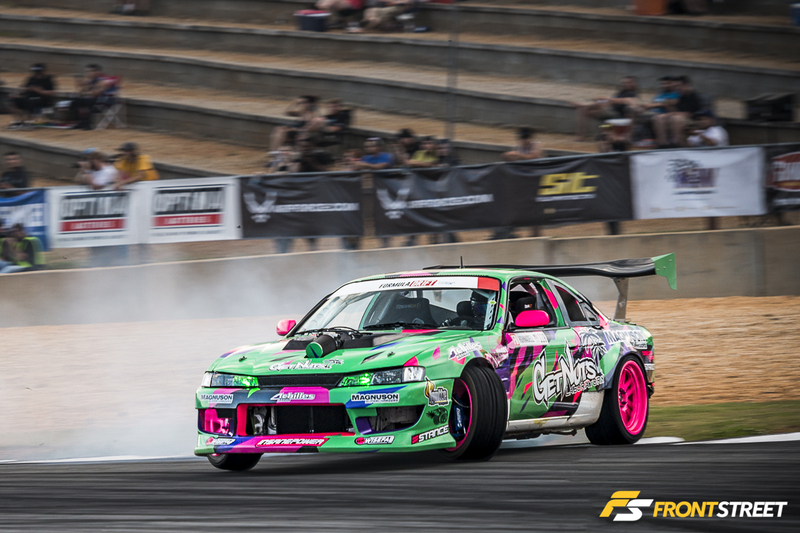 FS: Congratulations on winning Formula Drift’s 2015 Most Improved Driver award! Do you have any goals for 2016 (other than World Champion)? AH: Thank you so much! The Most Improved Driver Award was my main goal this year and it was truly a blessing to get. 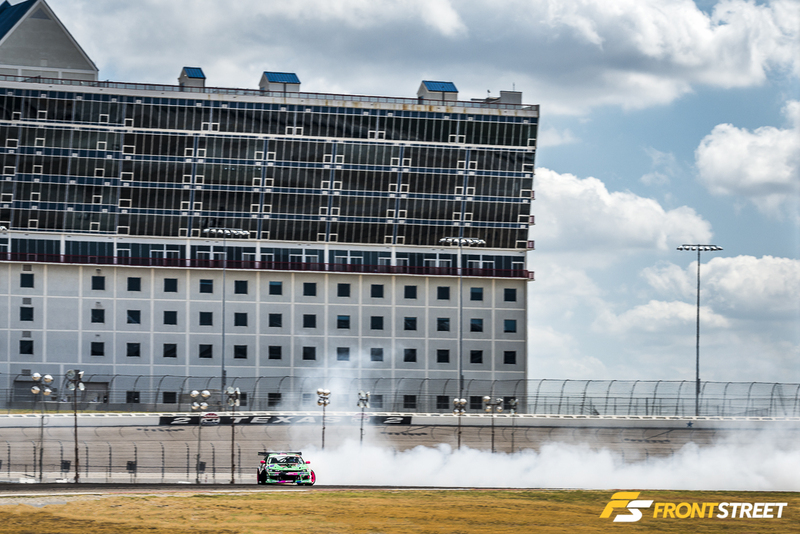 My main goal for the 2016 Formula Drift series is to finish the season on the podium. I would absolutely love to be the champion and I honestly don’t feel like that’s an unrealistic goal right now so we’re shooting for that number 1 spot as well. 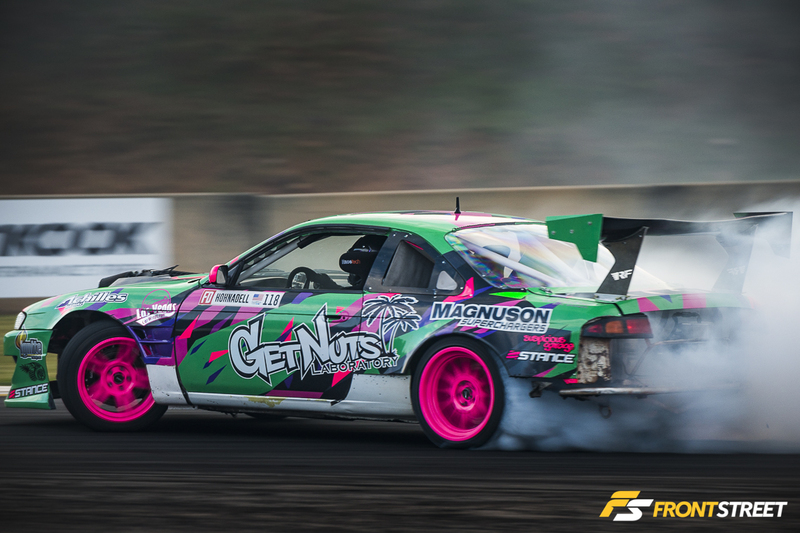 FS: You’ve been pitted head-to-head against some of drifting’s biggest names. Who is your favorite driver to compete with in a tandem? Is there a specific tandem battle in the past that resonates with you? AH: I love driving with everyone because every single driver out there has a different style. I’d say my favorite driver to tandem with is my teammate Forrest Wang. We both have similar styles so it ends up being a super fun and wild battle with tons of angle and smoke haha. FS: If you had to give one solid piece of advice to someone starting out in drifting or looking to join the Formula Drift ranks, what would it be? AH: To be successful in any Motorsports, including Formula Drift, you have to be professional. Social media is a huge aspect that sponsors look at. You can’t post anything negative, dirty, etc. if you want to be successful in this business. As for the car setup, focus on the suspension more than the power. Suspension is the key factor to every drifter/racer out there. If you have a ton of power and no suspension, your car is basically useless but if it’s vise-versa then you can only progress and move forward. FS: Last question, any long-term career goals or are you just having fun driving for now? AH: I would love to get into Rallycross, Formula 1, Stadium Trucks, and/or Road Racing. I love all kinds of racing and if an opportunity comes up and it feels right, I will go with that. I would love to always have something to do with a Formula Drift though. FS: Feel free to drop a thank you here for anyone who has helped you along the way. Thanks again for taking the time to answer these questions and good luck with your 2016 season! We’re excited to watch you and the team compete this year! AH: I want to give a special thank you to YOU for giving me the opportunity to do this! I would like to thank the Lord, my family, friends, fans and my sponsors for giving me the chance to live my dream. I wouldn’t be here without y’all.